Emma Train-Sullivan, SMASH Programme Manager and Peter Flanagan, Care Group Director for Humber NHS Foundation Trust spoke to the i-THRIVE team about the SMASH programme in schools. The Social Mediation and Self-Help (SMASH) programme is a group-based programme which takes referrals from schools. They work with young people aged 10-16 years who may be at risk of developing mental health problems. SMASH aims to build self-esteem and resilience and provide young people with strategies to cope with every-day stresses, negative feelings and issues that young people may be faced with at school, at home or online. SMASH sessions “consist of unique activities delivered through closed group circles, using restorative practice, conflict resolution, elements of talking therapies and CBT”. Emma has continuously developed the content of the SMASH programme over the last nine years on the basis of input from the young people involved, their families and input from the local authority and schools. The SMASH programme was developed in Hull in 2007 and was then funded as a pilot with Hull City Council as part of the Big Lottery funded HeadStart programme. After seeing the positive outcomes which resulted from this, East Riding CCG awarded the SMASH programme funding for a pilot in 10 East Riding schools. The East Riding pilot started in October 2016. How did the pilot work? The 12-week programme ran twice within each school between October 2016 and February 2017. For a school to be part of the pilot they needed to provide a member of school staff to support the sessions, £20 per session for food and refreshments and open access for the SMASH practitioner to the school setting. The schools needed to source and fund a local community-based venue for the sessions. The purpose of using a community venue was to enable young people to be linked into universal services during the programme to ensure there was an avenue for sustained input and encouragement to self-manage beyond completion of the programme. The schools also had to acknowledge their own role as an active delivery partner in the programme. In addition to the group sessions, the SMASH offer includes a day for a mixture of one-to-one sessions and outreach. The one-to-one talking sessions are offered on a needs-led basis. Family outreach is embedded within the programme. SMASH supports families to address issues relating to their overall family wellbeing and improve resilience. Young people who have completed the SMASH programme are known as ‘SMASH graduates’. They are invited back to provide peer support the latest intake of young people on the programme. SMASH graduates also have a say during the recruitment and training of new SMASH practitioners and can co-produce content for the sessions. SMASH received 228 referrals and worked with 215 young people across the six-month period of the East Riding pilot. Three referrals were received from the single point of access to CAMHS in Hull and East Riding of Yorkshire. Conversations between SMASH practitioners and CAMHS teams resulted in two young people attending the SMASH programme instead of being put on the waiting list to be seen in CAMHS. The pie chart lists the primary reasons for referrals to SMASH. 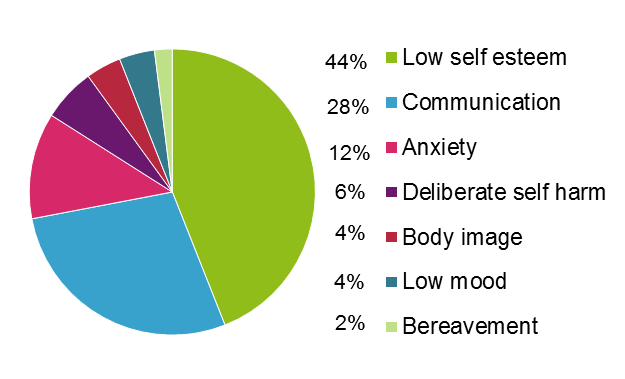 Low self-esteem was the largest reason. Peter says that one of the reasons SMASH is so successful is because it works for young people who have multiple needs unlike counselling services which may focus on one particular problem. Who are the SMASH practitioners? The SMASH practitioners come from a range of backgrounds with expertise in psychology, education, mental health, and specialist learning disabilities. They receive a lot of training and internal support to ensure effective delivery of the multi-faceted programme. SMASH practitioners attend five-day trainings which includes specific training around home visits because of their “family in mind” approach. Emma stressed the importance of relationship-building in the work of the practitioners so they are trained specifically in this skill. In-house training is provided for new issues being faced by young people to ensure the practitioners are prepared to meet their needs. What has been the impact of SMASH? Improvements are seen across all eight areas with the largest improvements typically in the ‘confidence and self-esteem’ and ‘feelings and behaviours’ domains. The University of Hull conducted an evaluation of the SMASH programme during the period of September 2014 – February 2017  which included the HeadStart pilot. They found evidence of increased self-confidence, self-esteem and emotional resilience as a result of the programme. The report suggests that there was some evidence for a reduction in need for specialist mental health intervention for the SMASH graduates. There is evidence that the SMASH programme facilitated re-engagement with universal services. On receiving the first batch of 11 referrals for young people at one of the community venues, 4 of them were already actively using the venue as a universal provision. On completion of the programme, 6 out of the 11 were actively using the venue after school hours for recreation and support. The secondary outcomes of the programme are self-reported improved attendance at school, improved grades and fewer detentions. Emma says she would like to formally collect this data in future to further evidence the positive impact SMASH has on the young people’s education. Schools say they have witnessed an increase in parental involvement for the young people who attended the programme. – Julie Wickenden (Assistant Head) at South Hunsley. What is the feedback from young people, their parents and carers? At the end of each run of the programme, a celebration event is held with SMASH graduates, and their teachers and parents. The latest celebration event featured videos and presentations from SMASH graduates sharing their experiences of the programme and the impact it has had on their lives. For Peter, the event really brought home the impact that the peer relationships formed during the programme have on the young people. One of the SMASH graduates said that they now had a friend to walk to school with as a result of meeting them on the programme. Consultations with the young people and their families took place at the community venues, via telephone and home visits for them to provide feedback on their experiences. The young people have expressed feeling in control of the care, support and interventions they received and feel they have been actively listened to. Parents and carers have expressed that they felt more like a part of their young person’s journey of care and felt better able to support them to sustain their resilience and mental health as a result of them being part of the programme. The families expressed how pleased they were with the holistic service SMASH provided and they felt confident in the service and its aims and outcomes. The cost of one twelve week SMASH programme is £5,619 for up to 16 young people at any one time. This price incorporates the whole day a week therapeutic group work element, the 1:1 talking sessions and family outreach. Each young person has access to a minimum of 75 hours of support and intervention. Included in the offer is an entry and exit assessment of need, 12 therapeutic group sessions at 6.5 hours a week in a community based venue and a home visit to identify any additional needs or protective factors. The programme is extremely cost effective. The cost per young person referred is £352.00. All young people who are referred onto the programme have access to the full 75 hours of support, which when broken down equates to £4.68 per hour. Additional hours can be accessed in the form of 1:1 talking sessions and intense family outreach all within the cost per head of £352 , the further additional hours of support accessed the lower the cost per hour becomes. How is SMASH aligned to the THRIVE Framework (Wolpert et al., 2016) ? Some of the young people who take part in the SMASH programme might be considered to be ‘Thriving’ but could be at risk of developing mental health difficulties in the future. For these young people, SMASH plays a role in promotion of emotional wellbeing and prevention of the development of mental health difficulties. One of the aims of the SMASH programme is to encourage young people to make use of universal services in the community which will help them to continue Thriving when they are SMASH graduates. Taking part in the SMASH programme is an example of ‘Getting Help’ because the SMASH practitioners are outcomes-focused with the young people and are clear about what a successful outcome would like. SMASH meets the needs of some of the children and young people who would benefit from some extra support but who do not require specialist CAMHS input. Shared decision making is a key principle of the THRIVE Framework. SMASH practitioners are trained in shared decision making and they put the needs of the young people they see at the centre of what they deliver. The THRIVE Framework encourages the use of outcome measures with children and young people who are ‘Getting Help’, ‘Getting More Help’ and ‘Getting Risk Support’. SMASH practitioners use outcome measures to show the young people their progress, evaluate the impact of the programme and used to inform the individual practice of the SMASH practitioners. Drawing on the strengths and resources of the family and broader community, wherever possible, is one of the principles of the THRIVE Framework. 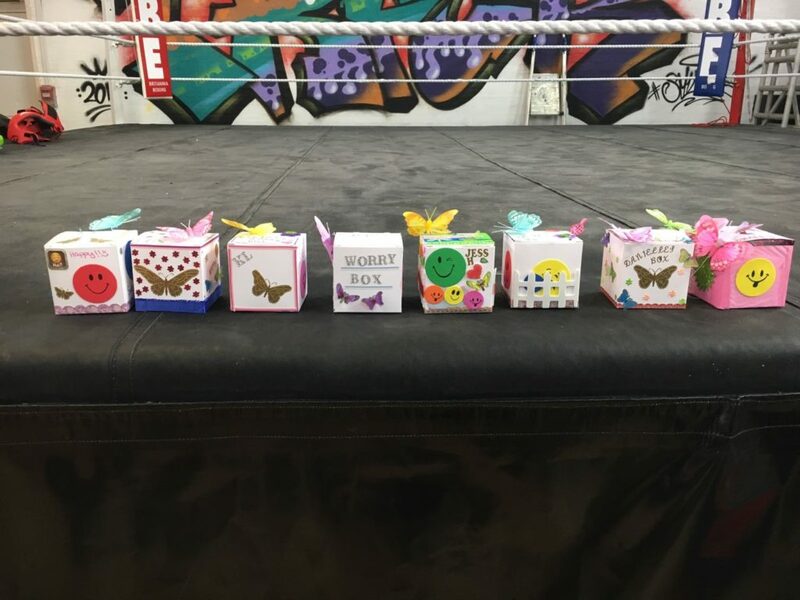 Through their work with the young people’s families and carers, SMASH practitioners draw on their strengths and help them to effectively support the young people beyond the programme. Emma would like to see more programmes like SMASH across the country. In the long term, Peter would like to see a shift in resource allocation from specialist CAMHS provision to programmes in schools which can prevent the need for specialist CAMHS from developing. If you like further information, please contact emma.train-sullivan@nhs.net.